Baffin Island is the largest island in Canada and the fifth largest island in the world. 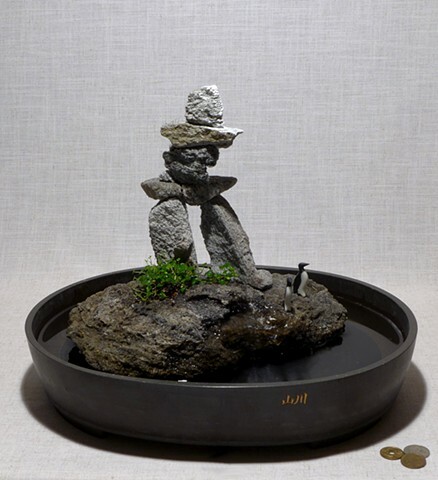 During the brief summer there, tiny plants emerge in the shelter of stone sculptures such as the “innunguaq” portrayed in this composition. “Innunguaq” is the Inuit name for objects in the likeness of a human, erected since ancient times to welcome visitors or to commemorate a cherished person. * In summer, Baffin Island welcomes several species of migrating birds, including thick-billed murres represented in this composition.